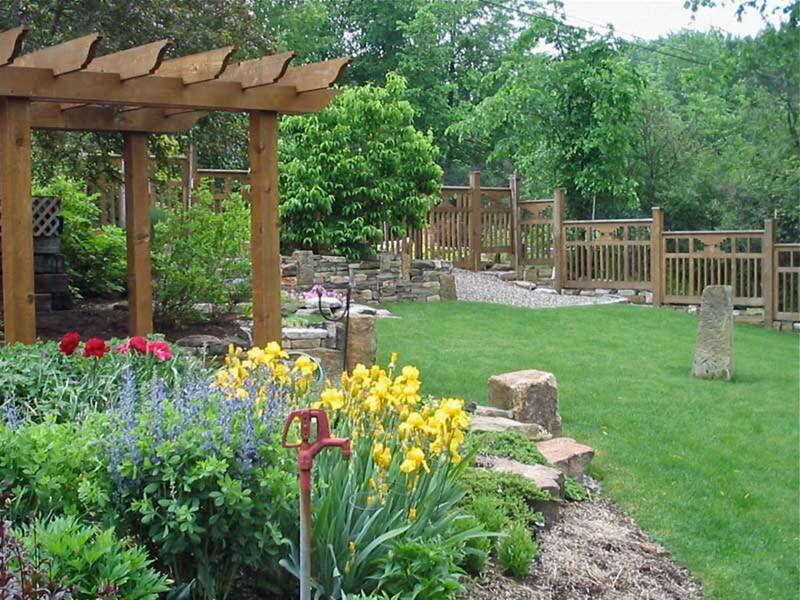 A cedar pergola over a path and a cedar fence divide garden in Ohio. Garden structures are part of the architecture, a necessary link between the Arts & Crafts house and its setting. 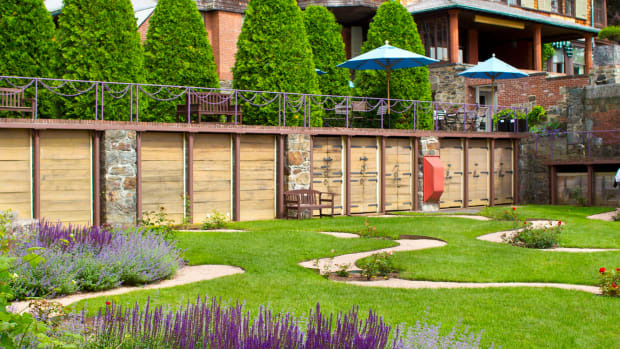 Artistic fences and arbors, treillage, and pergolas segue between the building and the garden, creating outdoor rooms. This flow is in contrast to earlier conventions, when the foundation abruptly met the ground. The pergola is an open-roofed structure, freestanding as an arbor or extended from the house as a porch. Filtered sunlight dapples the ground as it finds its way through vines and climbers. Although the pergola (from the Italian pergula) is essentially classical, pergolas during the Craftsman era were often plain, even rustic. Wood columns (in rows or colonnades) were typical, but so were stone and brick piers. 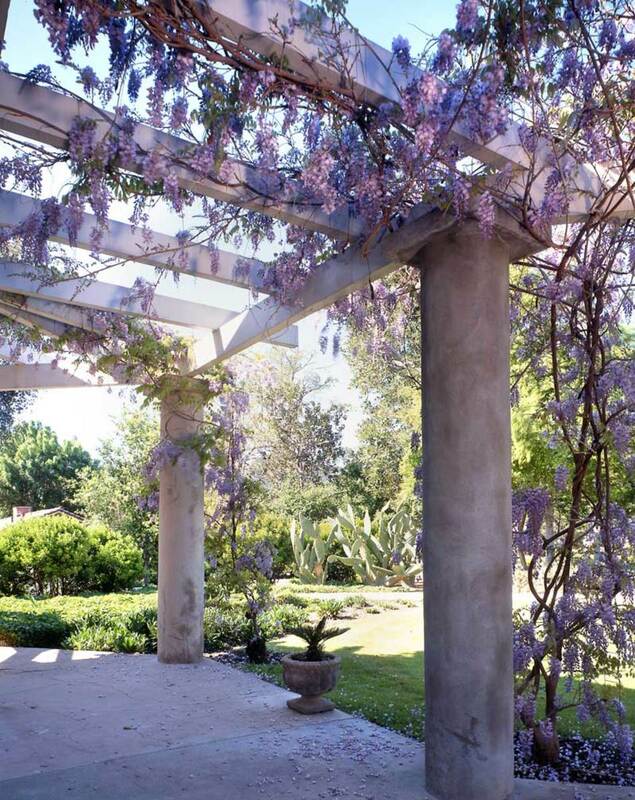 At the 1915 Lanterman House in Pasadena, a monumental pergola with elephantine cement columns supports wisteria. Tall or low, a fence telegraphs style and mood by its design and construction, materials and finish, and the shape and rhythm of its pickets. Casual entry from beyond the fence is through a simple gate. 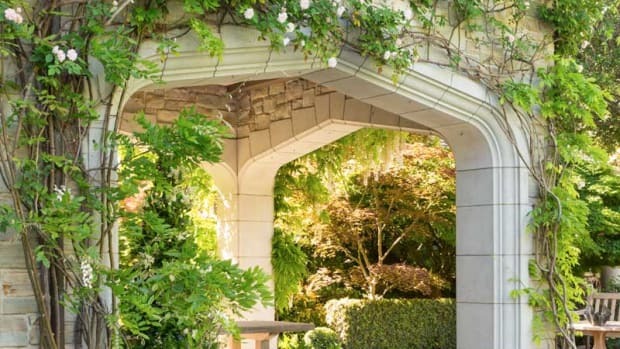 A grander entrance is made through an arbor—a framed doorway into the garden or private area. Sometimes a garden swing is suspended from the arbor beams, oriented toward a vista. Most often, though, the arbor is used as a transitional device between two distinct areas. Set on stone piers, a classical pergola by FineHouse provides a shady dining area. Trellises for training plants take their cue from the fence style. A trellis may be tight to a wall or used as a screen—as between piers on the porch, where it lends privacy. From plain lattice to inventive designs inspired by Greek, Arabic, or Chinese work, hundreds of variations in treillage appeared in the books and magazines of the early 20th century. 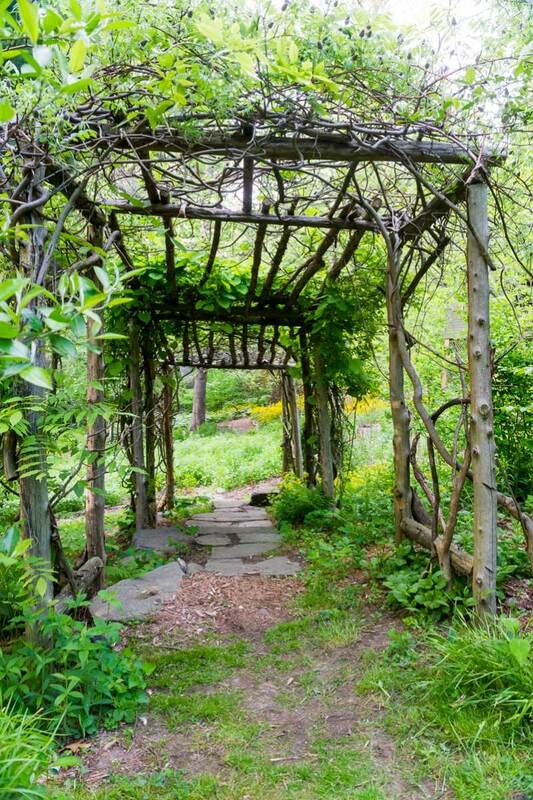 A rustic pergola is one element of a naturalistic garden in Hastings, New York. Garden structures reflected the region, of course. 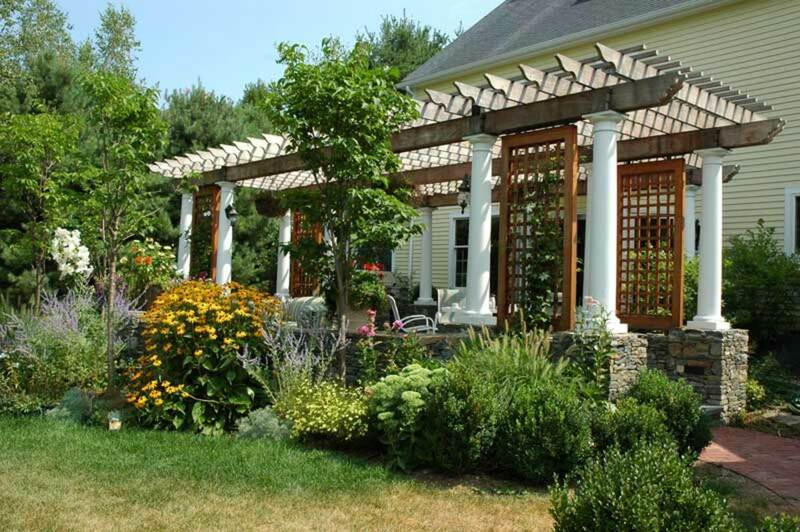 In New England, the fence or pergola often showed Colonial Revival influence. In the Midwest, exterior structures show the influence of the Prairie School. On the West Coast, the Japanese influence predominated with cut rafter tails, brackets, and Asian framing. Redwood is of ten used in the gardens of Southwest adobe houses. The pergola “has many traditions, but no formal rules,” Stickley wrote in The Craftsman. The pergola might relate to the architecture of the house, or suggest construction of a later date—or “it may bear no relation whatever to house construction.” Thus we see colonnaded Colonial Revival pergolas, urn-topped posts, and painted treillage accompanying medieval-inspired houses of stone… and then again, rustic twig structures behind formal homes. Detail of fancy-cut rafter ends on a pergola–fence by GardenStructure. 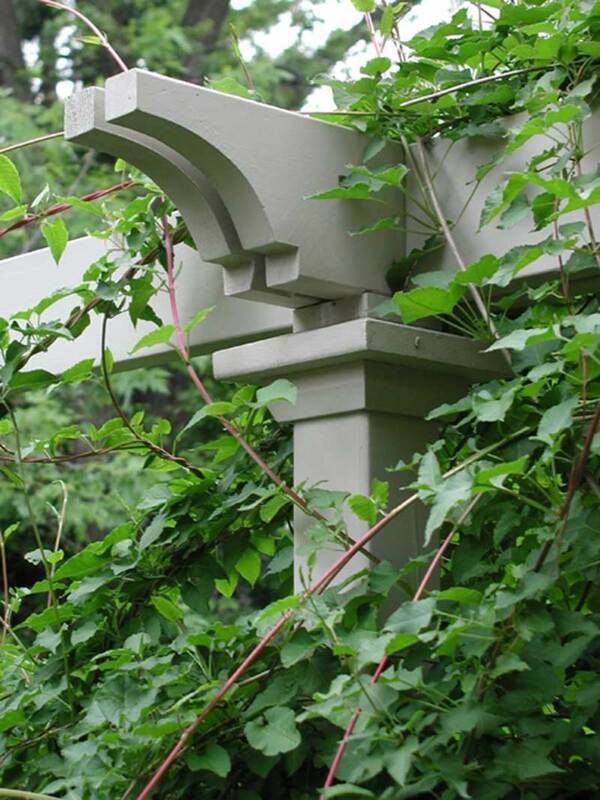 For painted outdoor structures, Stickley suggested using cream, green, or white—or the color of the house trim. White, dark green, and mid-range “natural” greens like moss and sage always have been popular. Rustic structures, of course, are gnarly and unpainted. 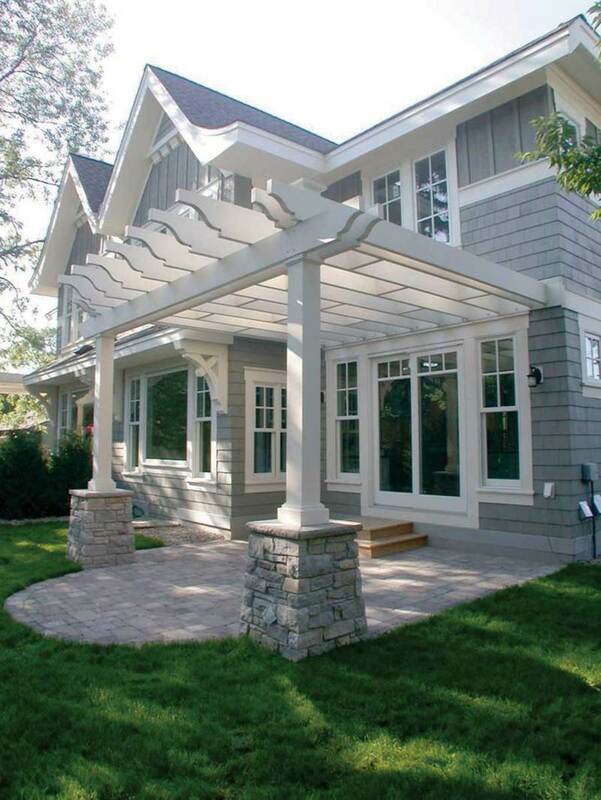 Traditional structures like this new pergola–porch can be built from modern materials that are impervious to moisture and insects (Kleer Lumber components from Tapco). 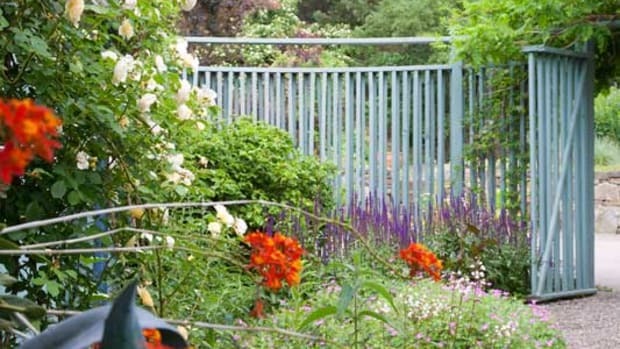 How one couple created a beautiful Arts & Crafts garden.